Hopi Kachinas are dancers: A masked dancer believed to embody a particular spirit during a religious ceremony or ritual. The Hopi Kachina are powerful beings or spirits who can use their magical powers for the good and well-being of the Hopi people, bringing rainfall, healing, fertility, or protection. 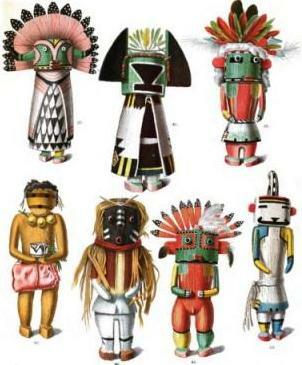 There are more than 400 different types of Hopi Kachina and each Hopi Kachina holds different powers and influence. Hawk Kachina: Keca the hawk has two parallel Mark on each side of the face. The body is white with black spots representing' feathers, but the forearms and legs are painted yellow. The wing-s are imitated by a row of feathers tied to the arms, and the tail by feathers attached to the breechclout. Keca holds in his left hand a hare and in his right a rabbit. Wasp Kachina: Tetanava the Wasp has body, legs, arms, and mask painted with parallel lines of green, brown, red. yellow, and black. There are two straight vertical horns on the head and a long slim proboscis. also banded with black and white. This being is impersonated in the winter ceremonies. Mocking bird Kachina: Yaupa, the Mocking Bird, has a helmet painted white, with a triangular design on the face. The beak is long and slender. There are clusters of bright parrot feathers on the top of the head. The spots on the body represent feathers. Bee Kachina: Momo. the Bee, has a yellow head with lilac crescent bands extending' on each side from the globular eyes. The back of the head is banded yellow and green. On the crown two long, stiff, black projections representing antennae. He carries a miniature bow and arrows. In the dance he imitates the hum of a bee. and goes from one spectator to another, shooting the blunt arrows at them. Snipe Kachina: Patszro the Snipe, has a figure of the snipe painted on the forehead, a long, slender beak, and semicircular markings on each cheek. These markings consist of white, red, and yellow bands, the first furnished with a row of black wings.